I’m a public figure and I am presented with wonderful opportunities to share my positivity. 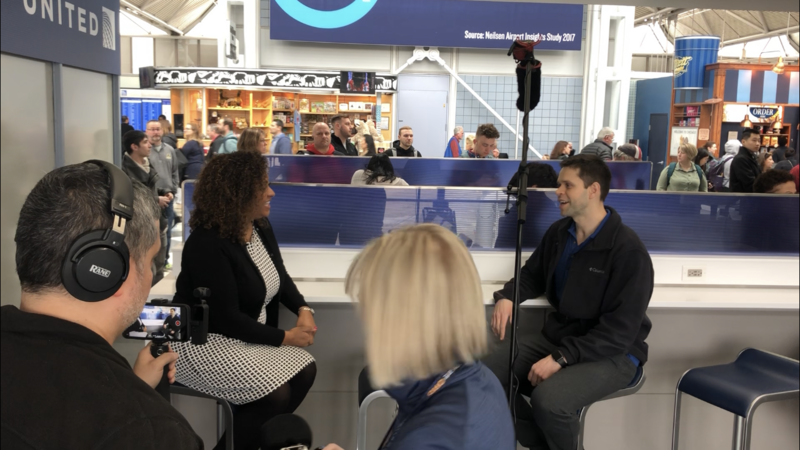 I’m at O’Hare 2-25-2019 and right after security I was approached to do an interview with United Airlines. This interview was filmed for new flight attendant training. Interview lasted about 10 minutes and it was amazing! As you can see from the picture we were staged at the gate. The producer at the end said I did great 👍🏻 and I took that to heart ❤️ so I gave him the last free digital copy of my book 📖 After I gave him my book I shared with him a statement… something that was on my mind… and when I said it I could see it in the producers eyes that he new I believed it. I said “Law of attraction works!” I said “look! This is why!” I showed him my phone and the audiobook I was listening to, it is called the Pitch Perfect, and it’s about saying the right things in interviews, or just about any other time you communicate with anyone. So I’m learning how to present myself much better. “Now here you are, talking to me, giving me this opportunity to practice what I want to do for a living. What an amazing day!”This is proof to me that whatever is on your mind and what you focus on you will attract. Every day take the next step necessary to get you closer to your true purpose. Try try and try, and then try some more, and after you have tried everything, try it one more time, and then the last thing you can do, is try again and again until you succeed! If you’re trying it’s impossible to fail! So many people who have succeeded in life had failures, and some of the most famous examples are Thomas Edison and the light bulb failing 10,0000 times until it worked, Michel Jordan getting cut from the high school varsity basketball team,..
I’m learning to be more positive every day, about everything. Follow me on this journey so we can make the world a more positive place, together .